Karin Kuhlmann was born in 1948. She studied photography and graphic design and has been a commercial artist for many years, working for such firms as Bertelsmann and Nobilia, and as a freelancer. 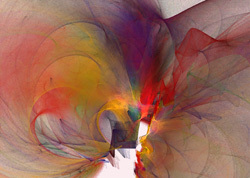 She discovered the computer as a personal artistic tool in 1994, and her digital work has won Corel and other awards. She lives and works in Verl, Germany. Since the beginning of working on digital art I’ve always been fascinated by fractals, which are always the visualized solution of a complex mathematical problem, describing natural phenomena with similar structures like the branches of a tree or the arteries of the blood circulation. Viewed in isolation of mathematical questions they are graphic patterns as a snapshot of the infinity. Like the surrealists and some abstractionists I prefer the “Automatism” for my creative processes in order to release my inner pictures. I usually generate a series of inspiring and associative shapes on transparent layers and combine it to subtile arrangements of glowing transparent areas of colors, including the light behind it. The selection of organic forms, their editing and coloring is based on that what psychologists may call “subjective perception”. Mathematical Art is - although it seems to be a contradiction in terms - a very intuitive and inspiring kind of work. My aim is to explore a higher conscious towards self mapping of personal and social conditions.